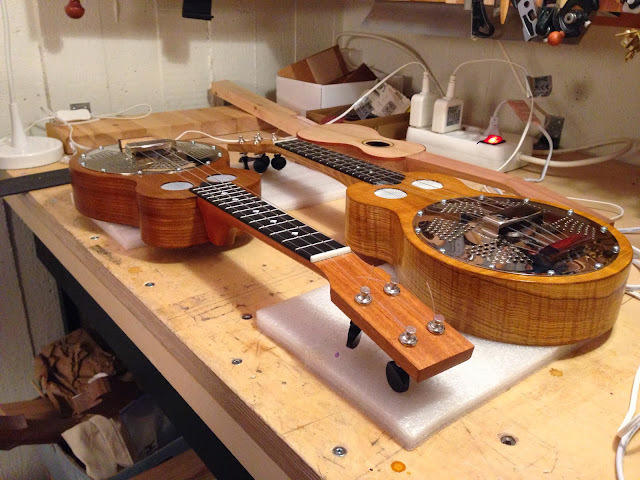 Since the two piccolos have shifted into the finishing stage, I pressed on a bit with the new koa soprano I'm making for a childhood friend. I made a black rosette with my cutter from Micheal Connor, the master tool maker. 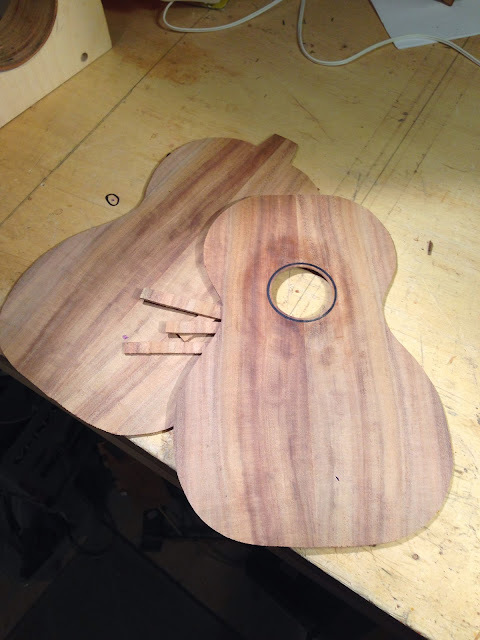 The rosette is glued, levelled and the soundhole cut. And the plates sawn to shape. 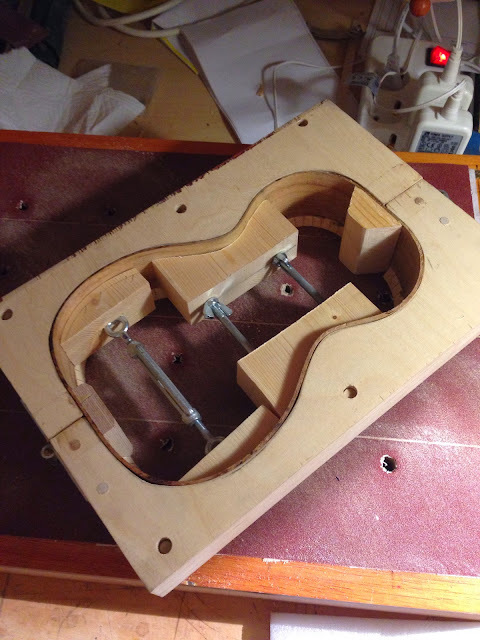 I glued in the neck block, the linings and then made spreader clamps for the mold. It's almost embarassing to admit, but I've used make shift, very bad spreaders until now. But no more, these are rock solid. 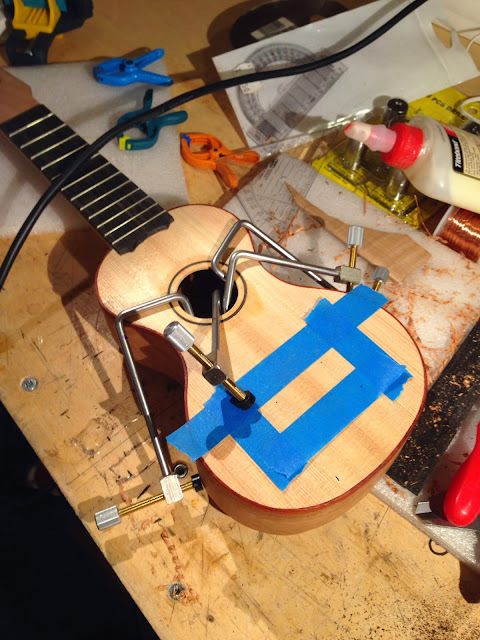 Did I mention I braced the top and put the bridge patch on? 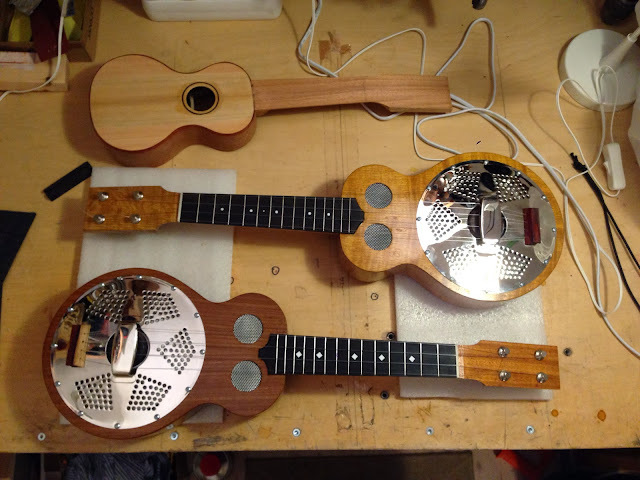 I did, and then I shaped the braces. After a short trip to Armenia I'm back and at it again. 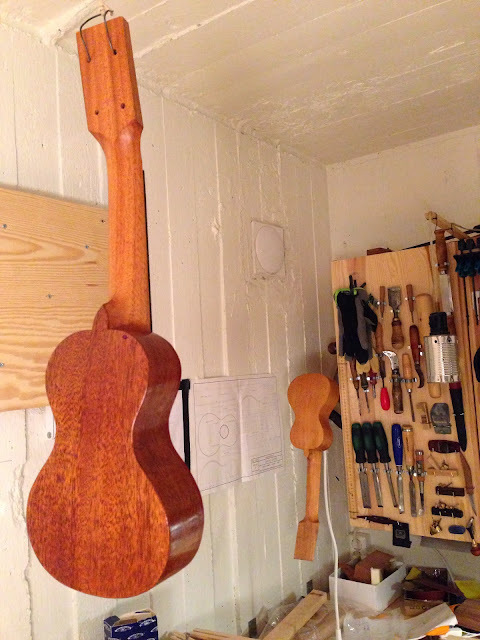 In the forst pic Patsy's mahogany / spruce piccolo is drying between glaze coats. We'll see how I manage the glaze part this time, it's getting better but how far will it go? Also behind it is a cherry piccolo I made, it went really smoothly and fast. 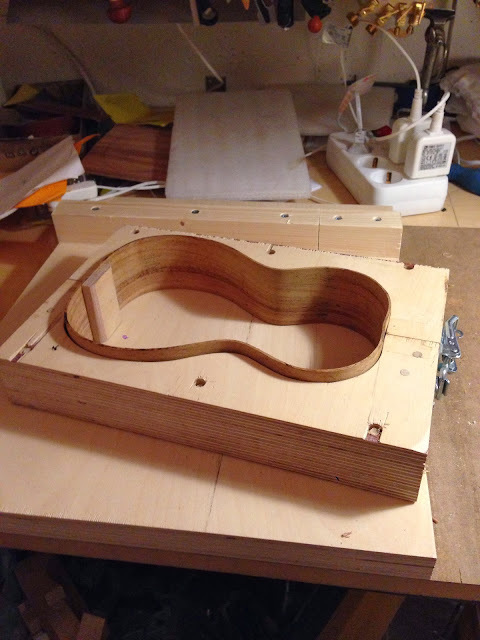 It's all but complete except top coats of finish, tuners and strings. 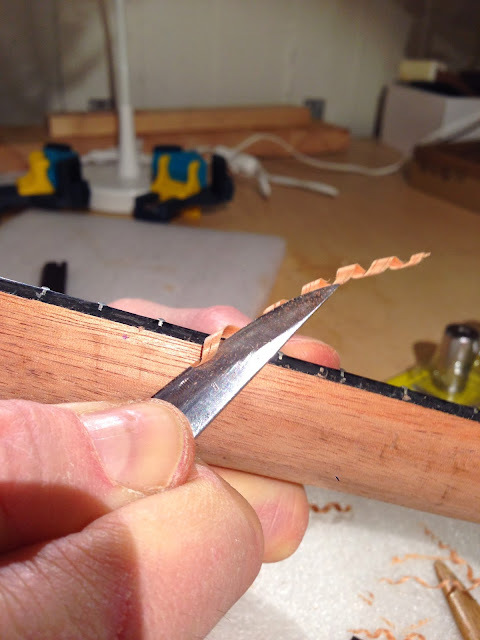 Then I glued the end block into a set of koa sides that I bent before going away. They had relaxed in the mold in my absence and were very cooperative. Well of course I could've waited 'til number 68 was dispatched but sides were already bent and Michael's been very polite so I started number 69 already. The top got its patch and single brace yesterday and the rim was lined, so today I levelled the edge and crammed it down on the solera. The middle go-bar presses down on the bridge patch to keep the domed shape of the top, the other bars aren't really doing anything. My screw setup is working great! Well worth the expense of investing, a hunnerd bucks as I recall. 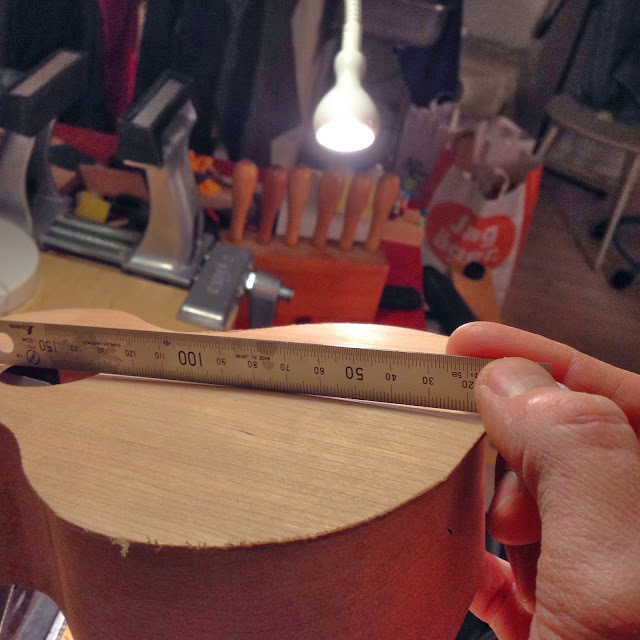 Then the neck blank. 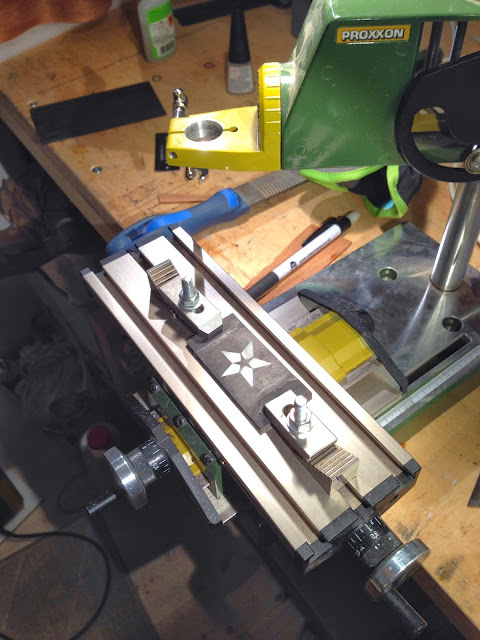 What you see is the Sjöberg Smart Vise, a bench front vise for... benches. 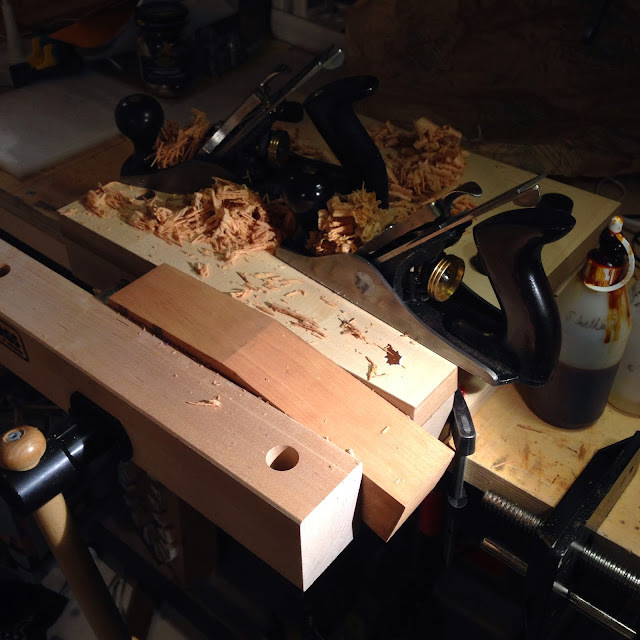 Without a front vise. I just got it and it seems to be a good addition to the dungeon. 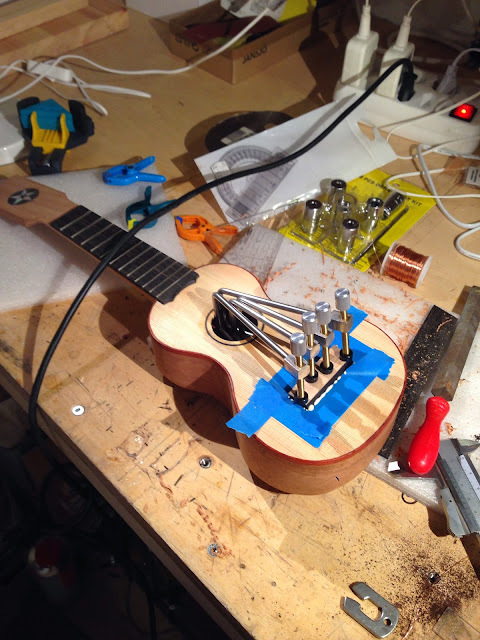 First the fretboard area was trued, and a line squared across in the approximate location of the nut. Then the headstock got it from my number 3 smoother. And after the kids went to bed I took the rim out to show the dome of the soundboard, in these last pics. Goodnight! Some rather interesting procedures have been made, without blog posts. And even worse, not all is photographed! But today I will show you a few things. 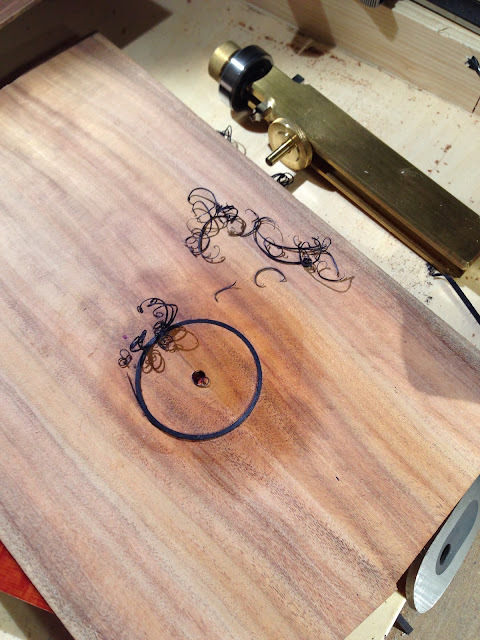 First is the piece of ebony in which I inlaid a star of mother-of-pearl. 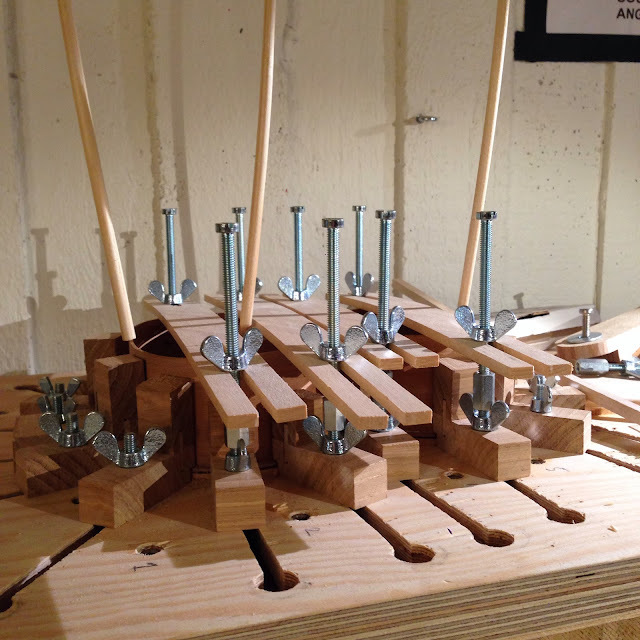 I made the five pieces first, with my Knew concepts fret saw. An excellent tool, there's a post about it somewhere around here. Then I scribed the contours on the ebony and routed most of the cavities with my Proxxon drill and its coordinate table, and since it was held there rock solid I left it there as I glued in the MOP and levelled it all. 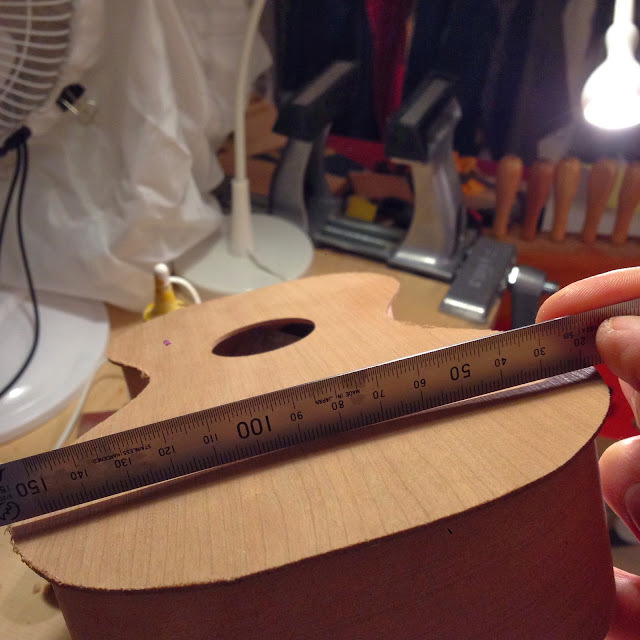 Then I sawed out the round disc which was inlaid into the headstock. 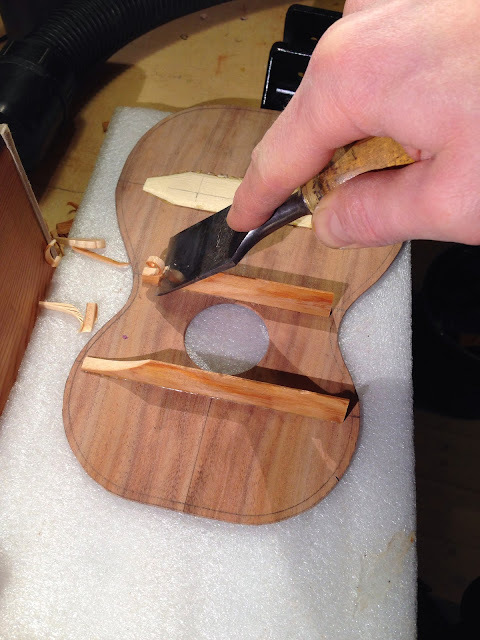 This proved quite dramatic as the glue stuck to a caul and a couple of splinters got torn out of the ebony. I won't go about it the same way next time, and I've gotten great advice from a couple of master builders. 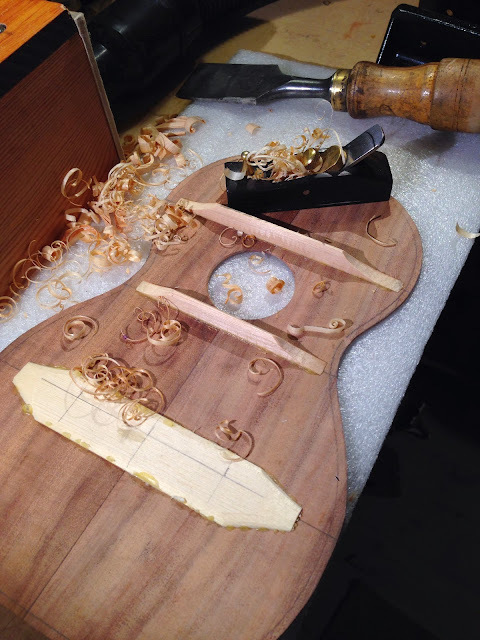 The fretboard was fretted and glued on yesterday. 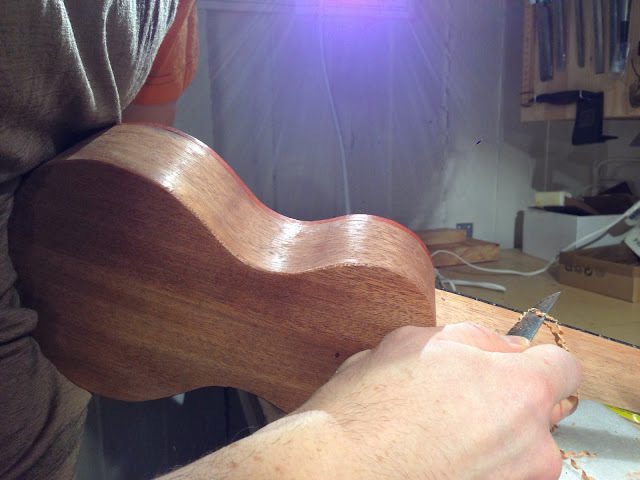 In the next pics you'll see me sneaking the neck contour up against the edge of the fretboard. Li took the pics! She knows a good shaving now from a poor one. Then we move on to the bridge! 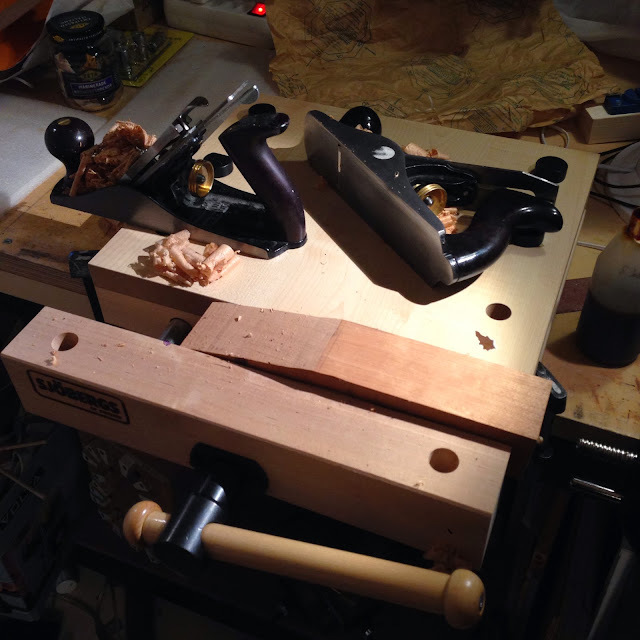 I made a really sweet small ebony bridge and the last pics show the preparation and then glueing. Now I'll start another piccolo I think, but a standard model of cherry.